What is the Biot number? 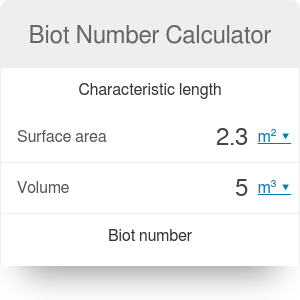 This Biot number calculator helps you compute the Biot number. What is the Biot number? The Biot number determines how quick is the heat transfer from the surface of the body to its interior. The text below explains the physics behind the heat transfer and gives the Biot number formula. The Biot number helps us answer the following question: How greatly the temperature inside a body will vary if we heat up a part of its surface? If the Biot number is small (much less than 1) then the temperature on the surface and in the interior will be very similar. On the other hand if the Biot number is large (much larger than 1) then there will be a large temperature gradient inside the body. If we warm the surface of a material, two things happen. First, we warm the surface. Efficiency of this process depends on the heat transfer coefficient. Secondly, the heat from the surface starts to flow through the rest of the material heating the interior. How quickly this happens depends on the thermal conductivity of a material. Check the thermal conductivity calculator to learn more about this phenomenon. The Biot number compares the efficiency of these two processes. If the heat transfer is more efficient than the thermal conductivity then the surface will warm up quicker then the rest of the body - Biot number is larger than 1. On the opposite, if the material conducts heat well then beside warming it up only in one place, its temperature will be pretty uniform - Biot number is smaller than 1.
k [W/(m * K)] is the thermal conductivity of the material. Bi is the resulting Biot number. Lc = V / A. For example for a copper pan of water with characteristic length Lc = 15 cm, the Biot number is Bi = 2.807. This means that when we heat the pan, there will be a significant difference in temperatures between the water at the bottom and at the top of the pot. If we decrease the amount of water (decrease the characteristic length), the Biot number drops signaling a more uniform temperature inside the pot. In the computations with the Biot number calculator we took the water thermal conductivity k = 0.7 [W/(m * K)] and the heat transfer coefficient between copper and water h = 13.1 [W/(m² * K)]. Biot Number Calculator can be embedded on your website to enrich the content you wrote and make it easier for your visitors to understand your message.